The school year is winding down but one little bookworm is still happily munching in our Library. 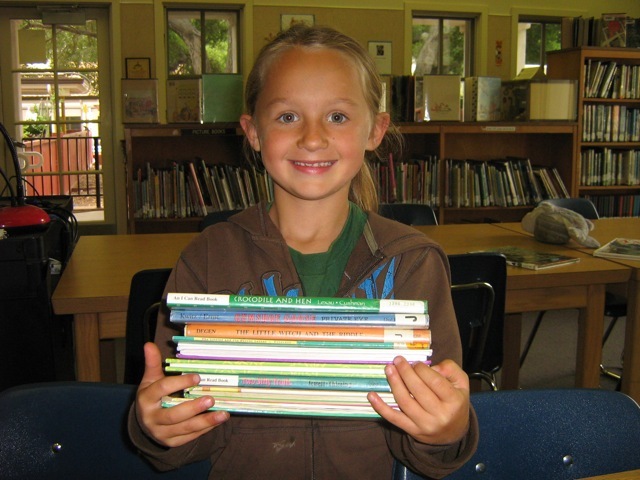 First grader Hayden has set a new school record for the most books read by a Bookworm. She is now completing her 5th card (there are 18 books on a card) and has checked out many books from our library and our public library, too. This is the best part of my job….seeing a child dive into reading, gain confidence in their skills, and develop of love of reading. Thanks to her mom for getting all those books from the public library! This encourages a lifelong skill, the understanding of the importance of libraries, and the desire to read for pleasure. Congratulations, Bookworm Hayden! In the Library this week…..
Kindergarten–When George finds a huge golden egg under his mother’s favorite chicken he knows it’s something out of the ordinary. The Egg by M.P. Roberston tells the delightful tale of the dragon who hatches from that egg and assumes George is his mother. Taking on the job, George teaches him the ways of a dragon and finally, reluctantly releases him back the the dragon world. One of the most enjoyable parts of the book for kindergarteners (aside from the luminous illustrations) is guessing what is in the egg. Prediction skills are an important part of reading comprehension and this book is a very enjoyable way to practice those skills. Second Grade–Second graders are busy doing research on dinosaurs and making wonderful ceramic dinos in art. So this week, they heard How I Captured a Dinosaur by Henry Schwartz. After learning about dinos in school, a little girl goes on a camping trip hoping to find one. And as it’s her birthday, she hopes to convince her parents that she can keep him as a pet. Lo and behold, she finds her dinosaur, an Albertosaurus she names Albert and because her parents promised she could have any pet she wanted, they rent a flatbed truck and bring Albert home. This books touches on one of the fondest daydreams of children—a dinosaur for a pet, and parents that would literally do anything for them! Third Grade–I love to read aloud books by William Steig. He never talks down to children and in fact, delivered book after book with stunning prose, beautiful and descriptive words that challenge students. Between the context and the illustrations students learn the skill of reading with context in mind and can figure out the meaning of words like flabbergast, odiferous, dawdle and more. This week Third Graders enjoyed The Amazing Bone and loved the language, including the wonderful spell (of nonsense words) that the bone casts to save Pearl, the pig. Fourth Grade–Fourth Graders reviewed their online safety skills this week with an interactive game on a website called The First Adventure of the Three Cyberpigs–Privacy Playground. This is an excellent website called Media Awareness and gives great information for students (and parents) in a very enjoyable and accessible way. We played the game as a group and discussed such things as not giving out personal information and understanding when sites are collecting information to use for spam mail. Fifth Grade–Fifth graders are working on their State reports in the classroom so this week Mrs. Wooten’s class used our atlases to find out information about state symbols. Sixth Grade–We played our final session of Library Jeopardy this week in preparation for next week’s Library Jeopardy Final Exam. Please start looking for those lost library books…..the big “roundup” is coming soon!